We each draw 5 cards, we choose a card each and place it face down. i reveal the card to be a fire type and you reveal a water type. water is strong against fire so my fire value is 1500 and your water value is 2500, you win that battle, and add the cards to your scoreboard which ill explain next. Scoring: Both players have a scoreboard with different difficulties, so ill explain. The game comes with a double-sided scoreboard, one side is easy and one side is difficult, the easy side has only 3 elements which are fire, fire, water. once you win the battle if your card is fire or water, you add that card to the score board, and if you defeated the opponent's which was weak against your element type and is a fire or water type, you add that card to your scoreboard, so your water type defeated my fire type so you add your water card to your scoreboard and you add my fire type to your scoreboard and all you need now is another fire type and once you fill up a board you gain points depending on the difficulty of the card. the easy side is worth like 2 points while the difficult side is worth like 5 points but requires more elements and a more variety of elements. Once you have filled up a scoreboard, you remove the cards from that board and start the scoring again, at this stage you may choose the difficult side or stay on the easier side, it's up to you. The game will come as is and will have all the cards you need to play with different difficulty scoreboards. Some cards could also come with effects as an example remove a card from the player's scoreboard etc, some cards might have evolving mechanics, such as if you reveal a fire card and you have an evolved fire card in your hand you can play it on top of that fire card to increase its power, or you might have a virus card or something in your hand and you can play it on your opponent's card once they reveal it to lower their power. - This particular idea sounds like a watered down version of Pokemon. There are Pokemon of all elemental types and combos which fight against each other, and some elements are weaker or stronger against others. That is the premise of your game. It's not impossible to make a unique game off of it, but I think it will be very difficult, because the comparison will be made, and Pokemon will be what you're competing against, particularly with kids. - There seems to be a conflicting mechanic, with how the game is scored. What is the point of winning against your opponent, but then scoring based off of what element was used? If it's a kids game, I think that will be frustrating, since the fun would be in battling against each other. Depends what's meant by "kids". Given that you have a mechanic that can involve the number 2500, you're definitely looking at older kids and pushing up against Pokemon. And once you add "plant" and "lightning" and whatever else, it's really not a RPS game so much. And I agree that the scoring mechanism sort of muddies the whole thing a bit and also takes it further away from a kid game, because second-order thinking (I need to try to win this fight to accomplish a completely separate goal) is not a kid strength. I'd say it either needs to be vastly simplified or it needs to be clearly distinguished from Pokemon and similar games. I think that if you replace the scoreboard idea with mini quests or victory conditions, the same issue will be there, if you keep the battling mechanic. Battling, by itself, can drive an entire game. If winning a battle doesn't equally reflect you winning the game, and it's a card game, I think it will be a hard sell. I'm saying neither of those things. Jedite said that maybe they would replace the scoreboard mechanic with a different one to fix a perceived issue. I was saying that that solution didn't seem to address the initial issue I brought up. The initial issue I brought up was that a card game where players are battling each other, is typical. But having them battle, and then calculate the results of the battle on a scoreboard seemed counter intuitive to the card battling genre. And if the game would be aimed at kids, it would probably be unappealing. So if players were battling, and the results of the battle were applied to quests or some victory point goal, I felt like it would still be a hard sell, because 2 scoring mechanics were happening. And other than Euros, I can't think of a game where you battle, but it's not the determining factor of who wins or loses the game. At least for me, I would pass on a game if it were described to me in that way. I could be misunderstanding Jedite's intentions though. Simultaneous reveal is more interesting when it isn't as simple as X beats Y. It's more interesting when you're both performing actions that may (or may not!) overlap in different ways. ...The initial issue I brought up was that a card game where players are battling each other, is typical. But having them battle, and then calculate the results of the battle on a scoreboard seemed counter intuitive to the card battling genre. And if the game would be aimed at kids, it would probably be unappealing. Funny you say this... Because I am working on my own design called "Monster Keep" (MK). And in this game the goal of the game is to achieve 15 Victory Points (VPs) before your opponents. Of course you "battle" other underlings but the key point in the game is the use of MATH and operators ("+", "-", "x", and "/"). Those operators allow you to SCORE VPs when you defeat an opposing unit. Rest assured that using a "score card" is a part of the game and it allows you to track your "resources" (the game has 3 of them) as well as your score during the 5 rounds in a game. The "battles" rely on ranges (1 to 3) and either a Melee attack or an Advanced Tactic. What you do depends on how you want your turn to play out. The one point that you do make (And I am sort of realizing it too) ... is that MK is NOT for tweens. Maybe teens and older... Too many factors and things to think about in a turn... I'd say younger children would find the game TOO BORING (because children tend to like "Take-That" and "Instant" type of battles — like in TradeWorlds). But still it merits some more exploration ... to see if this game is worthwhile playing. I only added a scoreboard to make it more interesting, battles do not last long it is whoever has the highest power wins and I thought just having that feels kind of boring. All you do is place card face down, reveal card, you might have counter card in your hand but other than that, it’s the highest power wins. Like I said, I'm using a Score Card for "Monster Keep" (MK) and it's real good. The Score Card is SO GOOD that I "trashed" a completely NEW version of the game, simply because the Score Card no longer "worked". Have you thought of a Round-Robin sort of Tree??? Something like that could maybe be FUN! There is no issue with having a scoreboard in a game with battles, like the game you describe designing. The issue is with a battling game, which sounds like a different game from what you made. Does your game resemble the fighting system of Pokemon, Duel Monsters, or Magic? Those, to me, are battling games. Jedite, it seems, has simplified that type of game, and made it more of an instant process, rather than going back and forth. THAT type of game, I believe, is not complimented by a scoreboard, at least not the way I understood Jedite's explanation. That is no comment on your game, or your design choices. And Jedite, if I understand your game correctly, you want to simply flip to reveal who has what. This sounds like both a luck based game and a push your luck game. I think it would work as a push your luck game, because rounds go quickly, and you can integrate scoring that way.Rather than giving your elements HP, give them values like card suites. Maybe stick with the 4 major elements for testing, and expand if you need it? Maybe there's a monster on the field your monsters are trying to beat, and all the players are giving their monsters element buffs each round to try and beat it. And the push your luck could be that if you wait too long, the monster is killed and you get nothing, or it gets too powerful and destroys your hand/treasure/reputation? And if you defeat him too quickly, you don't win anything, or the monster might respawn? Things like that could incorporate the elements and simple battling, while integrating score. And Jedite, if I understand your game correctly, you want to simply flip to reveal who has what. This sounds like both a luck based game and a push your luck game. That's because it is in a way similar to WAR! Take the topmost cards of two decks and reveal. The one with the highest value wins. There is no issue with having a scoreboard in a game with battles, like the game you describe designing. The issue is with a battling game, which sounds like a different game from what you made. Does your game resemble the fighting system of Pokemon, Duel Monsters, or Magic? Those, to me, are battling games. Well yes and no. It resembles Magic in that it has "creatures" and it's own "resources" and the fact that cards deal damage to each other. So in certain ways YES but in terms of overall design NO. Jedite, it seems, has simplified that type of game, and made it more of an instant process, rather than going back and forth. THAT type of game, I believe, is not complimented by a scoreboard, at least not the way I understood Jedite's explanation. I think it would work as a push your luck game, because rounds go quickly, and you can integrate scoring that way.Rather than giving your elements HP, give them values like card suites. Maybe stick with the 4 major elements for testing, and expand if you need it? ...Things like that could incorporate the elements and simple battling, while integrating score. While there are all sorts of ways that an integrated scoreboard could work. I'll let @Jedite1000 figure out what ideas he likes. I suggest things too, but ultimately it is his game. Maybe he doesn't want PYL ... maybe he doesn't want a Round-Robin type of scoring, etc. All we can do is suggest and let him do the playtesting to see what works and what he thinks improves his design. 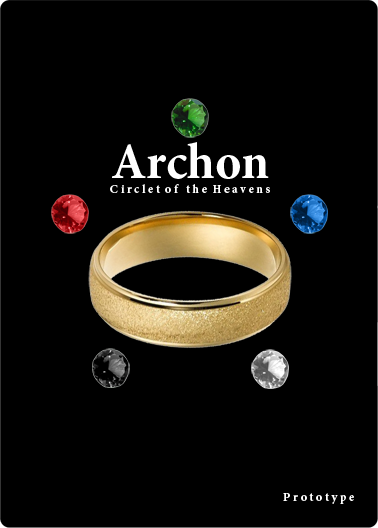 It sort of reminds me of an older design called "Archon: Circlet of the Heavens". But instead of only using an RPS-3 system, I was using an RPS-5 system which in turn breaks down into five (5) separate RPS-3 systems. Card backs revealed the RPS-3 currently being played but did not reveal the RPS-5 victor for each battle from the card ... there was "partial hidden information". Each player had to "out-think" his/her opponent by determining the best "color" to choose for each battle. It sort of used the "WAR!" mechanic to "drawing" a card and playing it... But I never pursued the design ... because it just wasn't interesting enough. However @Jedite1000 scoreboard was a more novel approach... Like I said I never pursued the design ... because I just didn't feel like I saw sufficient potential for what it was that the design would allow. But the only problem I see is that "simultaneous reveal" doesn't improve the odds of predicting or out-thinking the opponent. As I explained in Archon (one of my earlier designs — unfinished one might I add) each player could see the TRIPLET of colors and so each decision came down to an RPS-3. But which color would you predict??? Even with Partial Information, it still became a "guessing game". And I guess that's what turned me away from that design. Whether guessing from a pool of 5 colors or 3... The result was the same as RNG. You couldn't do better than do an "educated" guess. And IF you allow one player to go FIRST, that again means "partial hidden information" and makes it still a "guess" (again). So I just stopped working on that design when I figured out that it wasn't introducing more "strategy" ... It was still purely luck-driven. As I said it was an early design. As I can recall, I believe the 2nd design after Quest Adventure Cards(tm). I've since moved on from that design into things that are A> Simpler but more FUN B> Easy to learn but more complexe and hard to master. You learn through all the design you work on. Some aspects are COOL and you feel like you might be able to "re-use" them on another design... Possibly. i wouldnt worry about the pokemon comparison, pretty much all 1 on 1 battle games are rps. some have made it more complex, added layers and extra sides but they are still x beats y, y beats z, z beats x. its used because it works and its basically fair and balanced. b) there is some open info to base your move on. if there isnt any open info its just a guessing game and you dont even need a second player, just a deck of cards, or a d6. so i like your score card idea. if i know my opponent needs a fire/plant and water to make stew and he has fire and plant i am less likely to bet my water. it needs refining but i can see your idea. i think it is a little too simple for older players, at least to play repeatedly, but for younger kids no problem, keep the values single digits and they should be fine. This all reminds me of the game I recently published on TGC "Elemancy". It's a 2 player card game that uses a modified RPS-5 system. There is simultaneous reveal of two cards each with a shared resource that affects both player's cards and changes at the beginning of each round. Players have a hand of 5 cards each round and players start with a total of 20 health. Though some cards may seem weak, they are very versatile and can turn the tide of the game just as easily as the seemingly stronger cards. I think I have the rules up for free download if you want to take a look. So in the RPS-3 ... right? If that's the case you should have two (2) relationships. To the RIGHT, A -> B where A "beats" B and to the LEFT, A -> B where B "is weaker than" A. So you could express one relationship as being a "strength" A is STRONGER than B and a "weakness" B is WEAKER than A.
I liked the scoreboard. It's different. Winning "?" battles is very VANILLA. All three (3): Magic, Pokemon and Yu-Gi-Oh! consist of defeat the "card master". So I would steer clear of this because it's WAY "too common". The scoreboard reminded me of "NightLancer" (a game by another BGDF designer). His game was a Cyberpunk/Hacking game ... 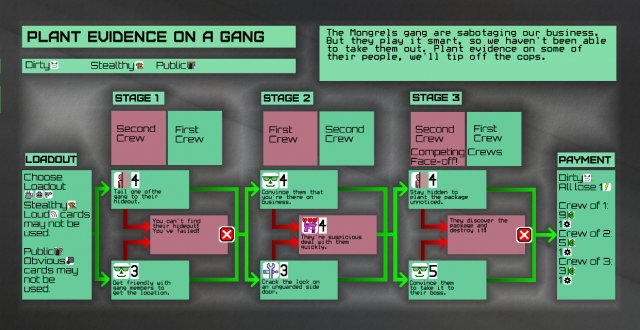 But in his "Mission" cards, you had something SIMILAR (much simpler though) where you could make decisions about what "path" to take to complete the mission. So yeah I think that the scoreboard sounded cool to me... Regards! I thought about it and ... well maybe you should make the "path" a bit RNG. What do I mean??? Well assume that you have a "scoreboard" with a bunch of "paths" to the end as you have indicated. But you can't "choose" the direction you go in. It's just a matter of luck of the draw (in terms of the opposing creatures that you encounter). So if your scoreboard is "Fire-Fire-Water" and you battle the first "fire", it sets into motion you going down that "track" or "path". Obviously there are multiple choices of ways from going from a point to another, but by having it a bit random based on the battles that ensue, you don't have to worry about players always trying to take the "quickest" path to the end (for example). Or the players choose the "easiest" path to the end (another example). Again no worries, I just wanted to show that other people have used this principle in other games. So don't feel like it's an isolated idea that nobody uses. I've shown you one example (NightLancer) and I'm pretty sure there are other games that have similar concepts. When I first skimmed this, I thought, woah, that'd be cool, have an asymmetrical objectives for different players in a simple "sorta like" WAR style flip game. First to Their own win condition would be interesting in a RPS game. Just thought I could prod your ideas in that direction, mostly because I like asymmetrical games as a mechanic, especially if they work!